New York's The Little Lebowski abides by catering to fans of a 13-year-old movie. 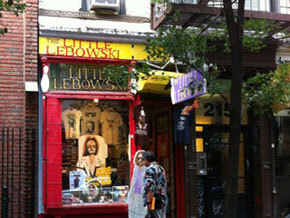 NEW YORK (MainStreet) -- The Little Lebowski is only 400 square feet. But in this tiny Greenwich Village establishment is packed enough merchandise based on 1998's The Big Lebowski to become an international hot spot. The store's owners, Roy Preston and Nicholas Dollak, make sure customers feel like they are in the movie. The store's dressing room also serves as a mock bowling alley, with rigged paper pins that flatten or pop up as the door opens and closes. Visitors can have their picture taken with their face in a cutout of the character Jesus Quintana (more characters coming soon) amid Lebowski T-shirts, DVDs, figurines and other trinkets. New York's The Little Lebowski abides by catering to fans of a 13-year-old movie. Like the hero of The Big Lebowski", its owners stumbled into success. It makes for a unique business model. Preston concedes that they didn't set out to open a shop based on the movie. It was only after several failed concepts in the same storefront that the partners stumbled on something golden. Preston and his partner originally opened the store in November 2007 as a children's bookstore. "A month after we opened, the U.S. economy collapsed and on top of that, we're in Greenwich Village and right down the block from Washington Square Park, which closed for construction. That cut off all the foot traffic," Preston says on a now busy Friday afternoon. The result was not good. Abandoning the children's bookstore idea, the partners moved on to a souvenir shop, then to comic books -- moving further and further astray from their original idea and deeper into a financial hole. "We were so broke we couldn't afford to order comic books," Preston says. "Whatever money we had got eaten up by just trying to stay in business," he says. "We had to borrow from this place and that place to pay the rent. There was no business during that period. We ended up exhausting all our finances in our first two years. We almost went broke." By this time, Preston was living between his car and the back of the store. Just a few months shy of being evicted and officially homeless, Preston decided to try one last gimmick and ordered a few Lebowski-themed T-shirts out of a vendor magazine to sell alongside the comic books. "My thought process at the time was, 'Well, I'm about to get thrown out, and if I'm going to go homeless, I might as well have some fun,'" he says. "We put them in the store and that was the only thing that ever sold consistently." "The Lebowski T-shirts are probably my best-selling item," he says. The partners decided to keep adding products catering to Lebowski fans and put a picture of The Dude in the window. Amazingly enough, he says, customers started coming in. Even so, he still thought he was running a comic book shop -- until TimeOut New York showed up to take pictures for a story.
" The Big Lebowski is one of those films that everybody loves," Preston says. "I don't do any advertising and people come from all over the world to see the store. It's strictly word of mouth." Even Jeff Bridges, who plays The Dude in the movie, has visited the store. There is a market for niche offerings, even micro-niche offerings such as Lebowski gear, marketing expert John Nolan says. "Certainly in this case the owner has created a business around an associative icon, however in this case it isn't Michael Jordan, it is a lovable slacker," Nolan says. "The global following of this movie has made it a cult classic, not quite like The Rocky Horror Picture Show but with the same associative qualities. There is something in most men a fantasy, if you will, that makes them wish they could slack off, not get up and go to work every day, not have to be so responsible -- just be The Dude." Fans can buy Lebowski gear through various websites, even attend an annual Lebowski festival, but it's fair to say Preston and Dollak are the first to have an entire store dedicated to Lebowski-related merchandise. Running a business that caters to a specific fan base, even if it's potentially a large one, is a risky business model, Nolan cautions. "If they don't have that type of associative, rare or unique offering, it's very hard to survive. I am not a fan of such a narrow niche where one cannot compete on price and cannot create a compelling, differentiated offering," he says. "They must always be creating new reasons for people to visit in person or online." Still, it can be done. Bricks-and-mortar niche stores should be in places with high foot traffic, have a storefront and signs that stand out as much as possible and definitely have a Web presence to expand exposure, Nolan says. Bill Sagan, founder and CEO of Wolfgang's Vault, a website where users can watch original recordings of thousands of concerts as far back as 1965 and buy vintage concert posters, T-shirts and other keepsakes, says to ensure that your company is able to deliver on its value proposition. "The value proposition in our case is that it's something that has meaning and is cool. As that pertains to us everything that we have is real. It was a real performance that played on a real night for which there is real poster-art created," he says. Merchandise should also not be so narrowly focused that it has a limited shelf life. "Every pop trend, whether it is Michael Jackson or Twilight or Harry Potter has novelty aspects that will be short-lived, but they also have elements of universal appeal on which you can build a sustainable relationship with your customers," a Wolfgang's Vault spokeswoman says. "In our case, Bill Graham's archive related to psychedelic rock. There's a passionate core audience associated with that. But over time our business has come to mean all things related to the modern live music experience of the past 60 years -- that's sustainable and growth-oriented." Sagan adds that making sure there is new content on the site every day is important, as it keeps customers coming back and brings in new customers. "We probably have 5,000 different concerts on the site right now. We probably have another 10,000 that we're preparing," he says. Still, it all comes back to quality, Sagan says. Even with the down economy, "indeed you will find people that will want to have a vintage T-shirt with the flying eyeball from a 1968 Jimi Hendrix concert and will pay $23 for it, rather than something they can buy at Target for $14.99," he says. Preston added a website this year for customers to order T-shirts, but he says customers prefer to come in to buy, which lets them see the store alongside others like themselves. Members of a cult like to know there are others in the cult. "The movie is 13 years old, and within the last year or two I basically started a shop based on this film and people are coming to the store. That tells you something about the staying power of the film," Preston says. Still, Preston tries to keep the merchandise fresh and appealing to customers. "Selling things to people is not rocket science -- just find a niche, find something that people want and sell it to them," Preston says. "Fortunately I found a niche where I can wear a bathrobe and pajamas all day and listen to really cool music." Business these days is much better for the two partners, who hope to one day open a second The Little Lebowski store. "We're still paying off debts, but we're keeping the doors open and actually able to put money in our pockets. I just got a new apartment," he says. He doesn't mention if it has a rug that really ties the place together.